By now, you've hopefully read our First Drive review of the new 2019 Chevrolet Silverado 1500. PickupTrucks.com Editor Mark Williams took GM's new truck through the hills and dales of Jackson Hole, Wyo., and delivered a great write-up of the all-new rig. Just a few weeks after the new Silverado was introduced to the automotive media, GMC followed up by launching the new 2019 Sierra 1500 at the other end of the continent, in St. John's, Newfoundland, at the easternmost tip of Canada. Why all the way out there? Well, GMC wanted somewhere different, somewhere the media hadn't experienced driving before. It was a way of trying to convey that the new Sierra is a very different truck from the Silverado, finally, after years of badge engineering and shared body panels. With GMC's mission to be a "professional grade" of trucks and SUVs, doing something unconventional should be expected. Creating a nicer truck than the Silverado should also be expected. But aside from a few exclusive features and some distinctively different styling, there isn't really much different between the Silverado and the Sierra, inside or underneath. 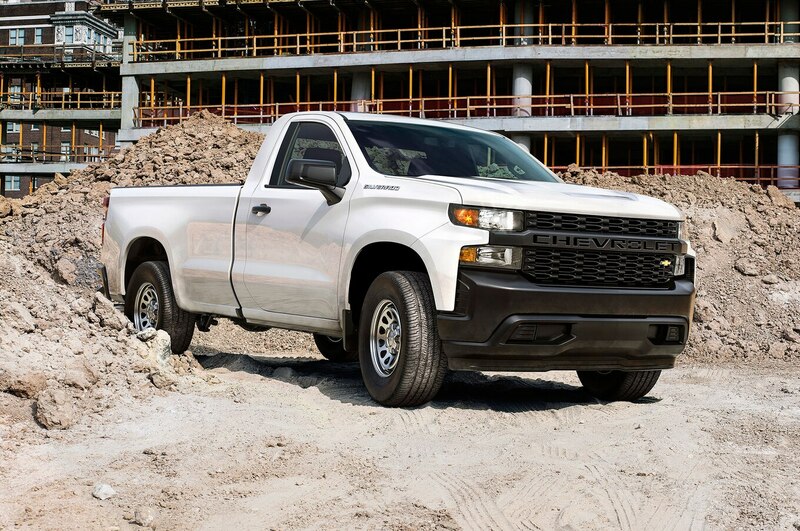 All of the impressive improvements we've seen for the 2019 Silverado carry through to the Sierra, too — the new, fully boxed frame; the mix of optimized lighter-weight materials in the body, bed and chassis; all six of the powertrain options; the slick new trailering app; and much more. Given how thoroughly we've talked about the engineering improvements for the new Silverado in that truck's review, we won't go into them here in great length, but you can read about them here. Suffice it to say, GM spent a lot of development money on the systems and components that make its trucks perform better and make them easier to own and use — but GM did keep a few goodies for the GMC Sierra exclusively. GMC brought the media to the pine-covered hills of Newfoundland, a remotely populated Canadian province full of amazing scenery (and endless ways to prepare codfish). Our route in the new Sierra covered a variety of terrain, from smooth, slow-speed roads interspersed with occasional potholes to higher-speed freeways. I sampled two of the Sierra trim levels — the mid-range SLT equipped with the 5.3-liter V-8 engine and an eight-speed automatic transmission, and the range-topping Denali that included the beefy 6.2-liter V-8 and 10-speed transmission. Both models performed impressively out on the road, with much sharper steering than in previous trucks. Directional stability is greatly improved over the prior-generation truck, as is body control — there's very little wallowing or dive when changing directions on a curvy road or rounding bends onto a highway on-ramp. The steering feel can be adjusted as well: Just twist the knob sitting at the upper left part of the dashboard into Sport mode, and both effort and feedback increase. The throttle response and transmission shift points also adjust to a more sporting nature, and in the Denali's case, the electronic suspension also adjusts the damping for a firmer ride. Braking feel and performance is nothing short of outstanding — the pedal operates with an excellent initial bite and continues to build progressive pressure throughout its travel, granting the driver a feeling of confidence and solidity. But ride quality is mixed depending on the version you sample — the SLT with its smaller 18-inch wheels, taller tire sidewalls and non-adjustable suspension actually rode more smoothly than the Denali despite the latter trim level's Adaptive Ride Control suspension and shock absorbers. Keep in mind that this is not the fancy Magnetic Ride Control system we've seen on GM's SUVs like the GMC Yukon, Chevrolet Tahoe or Cadillac Escalade, but a different electronically adjustable system. It seems counterintuitive that the less expensive SLT should have a more luxurious ride than the big-bucks Denali, but the seat-of-the-pants-o-meter doesn't lie: I preferred driving the SLT to the Denali over the occasionally broken pavement we encountered. The difference in powertrains is also rather shocking in that there doesn't seem to be much of a performance difference between the V-8 engines when you have an empty truck. The 5.3-liter V-8 in the SLT was punchy, smooth and never lacked for grunt. It makes 355 horsepower and 383 pounds-feet of torque, and it's mated to an eight-speed automatic transmission driving all four wheels through an optional automatic four-wheel-drive system with low range. This is also the standard powertrain for the Denali, but you can option up to something bigger if you want: the 6.2-liter V-8 pumping out 420 hp and 460 pounds-feet of torque. It's mated to a 10-speed automatic transmission, again driving all four wheels through an optional four-wheel-drive system (though it should be noted that you can also opt for the 6.2-liter V-8 in the SLT trim if you so choose). Both of these engines feature active fuel management and automatic stop-start to optimize gas mileage, and both systems operate quite unobtrusively; automatic stop-start can, however, be deactivated, unlike on some other GM vehicles. Throw a load into the truck's bed or hook up a trailer and things smooth out, naturally. We loaded up the 6.2-liter Denali's bed with what I estimated to be about 500 pounds of gear (lobster pots, a hay bale, a cooler, various logs and boards), and the Sierra didn't bat an eye. Even more impressive, a towing demonstration that involved four ride-on all-terrain vehicles on a flatbed trailer totaling about 5,000 pounds was equally uneventful, with the big V-8 handling the well-set-up trailer without any issues or drama. GMC says its goal in creating the new truck was not to go for "best-in-class" tow ratings because research showed that its customers rarely tow more than 5,000 pounds with its trucks. Instead, GMC optimized the Sierra 1500 to be the easiest truck to set up for towing instead of chasing an advertising number that doesn't have much real-world utility. We weren't able to do any towing with the smaller 5.3-liter engine, but we will in the coming months, so stay tuned for a more thorough towing comparison in the not-too-distant future. But if towing or hauling is not something you do frequently, shelling out more money for the 6.2-liter engine seems like an expense you simply don't need to take on — the 5.3-liter engine is perfectly acceptable on its own. Mechanically, the Sierra and Silverado are almost identical, save for the optional Adaptive Ride Control you can get only on the Sierra. Style-wise, however, they couldn't be more different. These may be the most different the two GM trucks have ever looked — only the roof, rear doors and back bumpers are shared between the trucks. While the Chevy has a wild-child, dramatic-fendered look to it meant to draw direct familial connections between it and the 2019 Chevrolet Camaro, the Sierra is much more traditionally trucklike in its look, with a big front collar grille, smooth fenders and body-side scalloping that eschews distinct fenders for a sleeker look. Styling is a subjective topic, but I prefer the look of the GMC over the Chevrolet with its cleaner, more cohesive overall design front to back. It looks especially good de-chromed in the off-road AT4 model thanks to monochromatic paint, more aggressive, chunkier all-terrain tires and a 2-inch suspension lift. Inside, however, I expected more from the Sierra, especially in the expensive Denali trim. The latest Sierra does little to move the bar for interior quality or luxury, and while luxury may not be terribly important on the Silverado, it's a key factor for the GMC Sierra. For many pickup owners, the quality of the leather or the fluidity of the switches or the gaps and fitment of the doors and panels on the interior are secondary to the truck's capabilities and durability — but when we're now talking about a $70,000 pickup billed as a premium model, you have to deliver the goods. Sadly, the Sierra Denali doesn't move the needle at all from the previous-generation truck's interior appointments or choice of materials. GMC describes the Denali's trim-exclusive leather hides as both luxurious and durable instead of soft and supple — "professional grade," which is frankly not an appealing descriptor of an expensive leather interior. We can rejoice in the fact that the steering wheel is now centered on the driver seat (unlike the previous generation). But in what is most likely a cost-cutting move, GM has removed height-adjustable shoulder belts from the interior. When it comes to premium feel and luxuriousness, the new Sierra simply doesn't meet the bar set by the new 2019 Ram 1500 Limited or the latest Ford F-150 Limited, both of which feature cabin environments that are far more plush, with much nicer quality wood, authentic-looking metal trim and overall designs that look more up-to-date. In fact, plant yourself in the lesser-trim SLT and you'll be hard-pressed to realize much difference from the Denali interior at all. There may be a few things missing, such as the digital information cluster in the gauges, the head-up display and the second-generation rear camera mirror that, when activated, provides a clear view behind the truck as if the backseat passengers weren't there. But in terms of trim quality, design, color choice and material luxuriousness, the new Denali isn't a big enough bump up from the SLT to make it worth the extra cost. Aside from the styling, there are really only two items on the features list that make the GMC Sierra more special than the Chevrolet Silverado, and they're both cargo-related. First is the magical MultiPro Tailgate, a new rethink of the pickup truck tailgate that genuinely proves its worth in versatility and utility. Able to be configured into one of six different positions, it gives the Sierra owner more options for hauling cargo than the Silverado owner gets. We stuffed the aforementioned cargo, a mishmash of odd shapes and sizes, into the bed and easily secured it, something that would've been much more challenging in the Silverado — or really any other pickup without the Sierra's novel adaptable tailgate. Even better: The MultiPro Tailgate is standard on both the Denali and on the mid-level trims (AT4 and SLT), and can even be outfitted with an accessory Bluetooth-connected speaker setup for tailgate parties. Second is the CarbonPro bed, in which the inner wall of the Sierra's bed is made out of molded carbon fiber instead of steel or aluminum (or both). It still has all the tie-downs you need in a functional bed, features all the width and space of the new Sierra's standard bed, but is nigh indestructible, according to GMC. The nature of resin-impregnated carbon fiber is that you can't actually dent it; it cracks and splinters, but dents from banging it or dropping something onto it just isn't possible. We may need to test this durability versus the Ford F-150's all-aluminum box and the standard steel bed of the other GM pickups in the near future. Full pricing is not yet published for the new 2019 Sierra, which is odd given that the new Denali model is arriving at dealerships as you read this. If you check out the 2019 Sierra on the brand's website, you'll actually see the old-model truck, which is being kept in production concurrently with the new one, but labeled the "2019 Sierra 1500 Limited" with very few options. Some pricing info is available, however, I was able to discover that the almost-loaded Sierra Denali I sampled rang in at $67,595 including destination fees, while the "lesser" SLT I drove came in at $59,495. Denalis are selling well for GMC, making up nearly a third of the total volume throughout the brand's entire lineup, so folks aren't afraid to spend some bucks on their trucks here. If you're looking for a more premium take on the Silverado, or simply something that enjoys all the under-hood improvements that are baked into both trucks but with more conventional styling and the slick MultiPro Tailgate, the new 2019 GMC Sierra 1500 is a robust choice — but for my money, the SLT would be the preferred pick. as a long time GM fan, I can honestly say that Denali grille is a downer. The red truck in the photos is appealing, but the big chrome mess on the front of the Denali is a face only a mother could love. great read. Sounds like they have fixed the TQ management issues with the 5.3L. I'm with papajim in the denali....just not feeling it. My personal choice had always been to save $10k right off the bat and get the SLT with premium plus package. I can live without having denali stamped on my seats. When will be get a comparison? Now, I'm not a fan of that fake-big-rig grill, but it does look better with a body-colored surround instead of chrome. The rest of the truck looks good. However, it's a good $30K out of my reach, even if I were willing to go full-sized... Which I'm not. Not a fan of the side mirror placement on the new GMs. GMC misses the mark with their new "upper leverl" or "top shelf" strategy. They are trying to be a luxury truck or something but Ram and Ford just toast them in interior quality. I don't understand why GM does not let Cadillac have GMC and let them put an "Escalade" spin on the truck. This along with the new styling should have set them apart from Chevrolet. The Denali is a huge disappointment. "GMC says its goal in creating the new truck was not to go for "best-in-class" tow ratings because research showed that its customers rarely tow more than 5,000 pounds with its trucks." So much hate for the Honda Ridgeline's lack of towing ability around here, but now it doesn't look so bad, does it? Even GMC (you know, the "professional grade" people) agree with Honda that most people with light-duty pickups don't need all the capacity. Bravo to GMC for not falling into the nuclear arms race that is Ford marketing hype (coming from a Ford guy mind you). Wish I had waited and bought this new GMC Denali instead of the new Ram. @CT, you do not want a GM, trust me. The Ram is soooo much better. Totally Nissan Titan look-a-like. GM has always had unattractive interiors in my opinion. The overwrought "grille on wheels" styling isn't working. These trucks needed to be a little larger [which, on paper, they are] to better compete with Ford. Unfortunately, they look fatter as opposed to larger because the the stubby proportions set up by the short hood, high belt line and low-appearing ground clearance. Agree with pops on this one, I know styling is a personal choice but on this truck with this grill, exactly what were designers thinking? Customer feedback where was it or did some actually like this? IMO 19' - Ram limited, styling wise they nailed it. I don't have a life, so I really care what my truck looks like, rather than how smartly it is built for its intended purpose. They need to get the kids that grew up with Legos out of styling. Apparently they are building these for the "real people not actors" hipsters from their commercials. God awful overdone design like it's straight off an Autozone or Pep Boys mod advertisement. Load capacities cut down because hipsters don't haul or tow. The president's new NAFTA deal with Mexico will boost the fortunes of American auto workers, North, South, East, West and will assure that new American cars are made of American made components and systems. I can hear the chickens clucking already. This truck looks way better with out chrome. Was that intended? Normally, a GMC is a chrome hound! The general consensus is its liked except for its interior. Its good that GM is getting around to fixing so much with this generation of truck that others have had down for a LONG time. Centering the steering wheel, putting the DEF tank and filler where they should be, getting the frame off of the ground, actual modern drive train choices/combinations including a diesel and small displacement turbo, a step in the gate, cameras like the competition, modern body materials (OMG the doors are made of beer cans careful in a crash), ect. With that kind of price on a "lux" truck one would think Magnetic Ride Control would be at least available. This could easily appear in a mid cycle refresh but still kinda sad its missing. All these GM fans are going to have a hard time with these new finally modern trucks. They've spent the last decade doing without, making excuses, and even celebrating simple dumb trucks. Welcome to the new age. I drove my simple dumb pickup about 250 miles yesterday and loved every minute. Speeds averaged about 55-70 and it was so quiet in the cab that I almost felt compelled to turn off the radio just so I could enjoy the beautiful music coming from that Chevy V8 the engine compartment. 104 thousand miles and going strong. No smoke, no leaks, original AC, brakes, engine, trans, alternator, injectors and water pump. The only thing not original is the coupon book. The truck was paid off a long time ago. Ford rules, same here, overall its a nice truck, but the wheels and interior kill it everytime for me. With all three major truck manufactures having released their latest designed trucks it is clear that the GMC Denali will remain at the top of dream truck list. Try maintaining your vehicles. They will love you for it. I've never had a problem with how a Chevy/GMC truck drives or performs. Where I've had trouble is keeping them out of the repair shop. For quite a few years, I wouldn't buy any other brand. But eventually I tired of the amount of time they were out of commission and, especially, the continual repair expenses. So I switched. And have never regretted the move. If GM can ever get that part right, then I'll reconsider. But until then, no way. How much does GM pay you to spew this propaganda? You and TNTGAY are pathetic shills. Papa- another useless post by the master, you. Thanks so much for not knowing how to respond to something you do not agree with. I don't spew propaganda, you jealous clown! I speak the truth, yet you can't handle that! GM designers must be like monkeys,,bc that awful GRILL looks same as certain Frod truck..
so do the headlights btw..
Last time Ive seen nice front end was on 2000..GMC ,,simple nice,aerodynamic like a bullet..
wont be buying this anytime soon.. Besides Im very happy w my 08 Silvy.. I like it! The front end looks very good. I think it needs more of a real front bumper and may be a bit overdone, but pics never do a vehicle justice or injustice for that matter. The worst and most hideous looking truck of the new ones is the Silverado with the Fisher Price like " C H E V R O L E T " across the front. That is seriously the biggest "look at me I'm a cheap fleet truck" design ever produced. Lmfao..what's up Mr. Jealousy! Stay on topic. U 2 have trouble with that for sure. Stay on topic u clown. Your the biggest complainer on here.. I can't wait for comparison... Excuses will roll in even more than they do know from you.. I was completely on topic. You wouldn't be smart enough to even know what the topic is because you get so hurt so easily. What facts are you talking about? I wasn't evem in your littlw tirade piece. Get a life loser. Mr. Hypocrite. Jealous because an engine less than half GM's (not yours because I'm sure you don't own anything nice except your trailer) runs the EXACT same 0-60 time even though it's rated way less hp and torque. A man (not you) could admit that's impressive. Keep taking your empty beer cans in for lottery money. Maybe someday you'll be able to afford a nice GMC like the one in the article. It's a good looking truck!! Looks like BA is living up to his name aka Big @nus. An engine with 2 turbos creating the power. Ya wow super impressive. NOT! Your unreal...give me a 5.0L before that ecojunk! And with the issues those 2.7L are having. But u dont wanna hear about that bc u drink the koop aide!! Good luck. I'll take a 5.3 or 6.2L. Any day! And the TNT ADD rant goes on. The GMC Canyon looks nicer than this new full size. Nice truck , but getting too expensive. I do like that it comes with an inline diesel like the Canyon, hope it is as bulletproof as my Canyon Duramax Diesel has been. 3 years, 120,000 kms and no issues. I can't wait to drive the 3.0 Duramax in the. Half ton. I've argued about the size of these trucks for years; I still believe they're much bigger than they need to be. But that's beside the point here; we're comparing like for like as best we can. First off, these full-sized trucks are grossly overpriced and have been for almost 20 years. There's no reason a pickup truck--a proper utility vehicle--should cost upwards of $40K and more. Sure, luxury has been added into them but these things are pricing into exotic ranges--purpose-built luxury vehicles that are more for show than function. A good, functional truck needs to be affordable and to be quite blunt a base-model full-sized truck should be priced no higher than the mid-$20k range. Adding 4x4 should not add $5000 or more to that price, either. It used to be that going 4WD only added about $1500. Even if you did add some luxury appointments... like a '95 Lariat, which used to be top of the line, you should still have a 4x4 version for less than $35, not kicking up around $55k to $60K where the current versions are priced. Even with incentives, they're more than $10K overpriced! And that touches on the second factor--the level of luxury in them. Why have, with some brands, twenty to thirty different trim levels, when taken across a total of four bodies? Oh, I understand the body part... extended cab, crew cab, short bed and long bed for each... but then to tack on so much luxury that the truck is almost useless for work? Heck, they're even being advertised as an "Office on wheels," not a true work vehicle. Why even have a bed on the truck if that bed's never going to be used? Even discounting the off-road sport models like the Raptor, ZR-2, TRD-Pro, etc., some of these trucks are verging on $100K price tags. Why? Are we all so self-centered that we have to put on airs and buy things so far out of our budgets that we have to spend nearly a full decade just to pay for 'em? Are we all so conceited that we have to show the world how privileged we are? Guys, if you're going to spend so much on a truck, you'd better get a full lifetime's worth of work out of it. That truck's value IS going to fall if you're planning to use it just as a status symbol. If you want CAFE and EPA and all of the Safety Nanny electronics, there's a price to pay. Did your old Ford pickup have a backup camera and a slew of airbags? No. Did the old Ford have all the OBD II diagnostic functionality? No. The companies building trucks today are in a white-hot competitive market for consumers. Why do you think Ford and GM spend millions advertising on NASCAR and NFL every year. It's big business. I'm just replying to your hoodwinks nonsense. I agree with most on here about that chrome face being over the top, the paint-matched front does look a little better. I agree with you totally on the side mirror placement. If it gets damaged or ripped off, its going to damage the door also. One one hand interesting idea. Not really sure how we all survived these many decades without it, lol. This may be an innovation in search of a need. Time will tell. I do wonder about it's complexity and how well it will hold up with robust use.